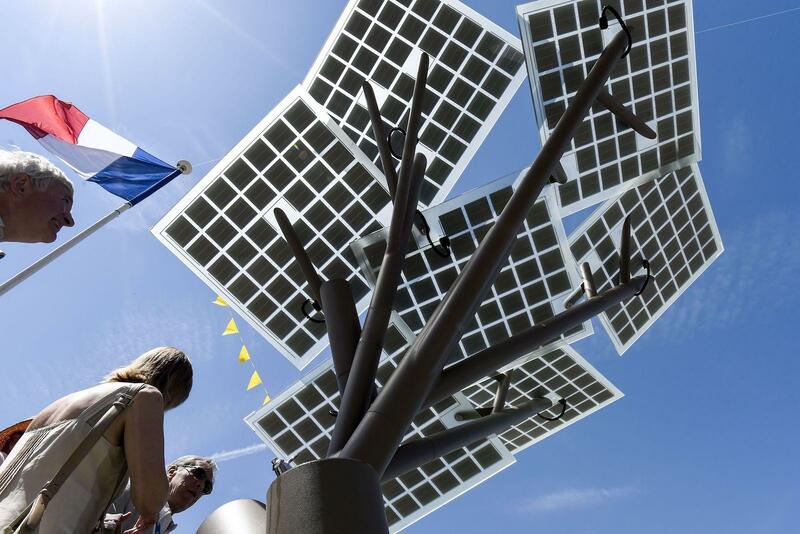 In the midst of a European heat wave, one town in Central France has installed the continent's first-ever solar eTree. The solar-powered tree provides shade, water, and green technology to residents while drawing attention to sustainability issues. The novelty—half function and half art—was created by an Israel solar company called Sologic, and promises to harness the beastly sun’s rays for cooling power. Europe has been pushing records in May, with France already surpassing 86 degrees and Norway setting records, Treehugger reports. Meanwhile in Nevers, France, they’re trying to draw attention to climate change with a Sologic eTree, a brown metal trunk shaped like a real tree with “arms” supporting solar panels standing in for broad “leaves” at the top. The structure, half-art and half-function, provides Nevers' 38,000 residents with a shaded resting area, charging capabilities for smart phones and other electronics, a water trough for pets or water cooler with fresh drinking water for people, nighttime illumination, free wifi, and even an interactive LCD display for community information. That display features a camera and screen that can show the weather, educational and environmental content, or even allow for communication between eTree locations around the world. The eTree is effectively merging conversations around sustainability with public use of green technology. Sologic - Renewable Energy Systems is an engineers-run solar company in Binyamina Giv'at Ada, Israel, whose products seek to educate and inspire a sustainable future. Its latest project is the eTree, a series of solar structures resembling trees for residences and companies. Each style has a varying wattage output and capacity, with features like the aforementioned LCD display, wifi, and drinking station. Because of the power they generate, eTrees can even be used as power sources for other services. The price tag currently sits between $20,000 and $100,000, but the company has been rumored to be tinkering with smaller versions for individual residences in addition to schools, parks, libraries or urban centers. Sologic’s eTree prototype, created by Israeli entrepreneur Michael Lasry and designed by Israeli artist Yoav Ben Dov, was launched in October 2014 in the Sustainability Garden at Ramat Hanadiv, Israel, where average temperatures can climb easily toward the 90s. The eTree quickly won critical acclaim at home and abroad. eTree USA recently launched in Aurora, Colo., offering stateside services. It may be that by interacting with green technology and experiences solar energy up close and personal, more people are encouraged to incorporate renewable energies into their own homes and everyday lives. And that makes the eTree less a tree and more ripple. Imagine: Instead of hanging around inside coffee shops, people could take to public parks to catch up on emails or take care of some computer work. All the indoor technology you might seek in an afternoon could be captured while enjoying the great outdoors. In addition to Nevers, France, eTrees have already been installed throughout Israel, at the Climate Summit in Paris, France, California, Colorado, North Carolina, and in the Caribbean. The Nevers eTree is the first of its kind anywhere in Europe—but surely won’t be the last.